Rooted in Faith. Strengthened by Love. Happy Easter to all of you! 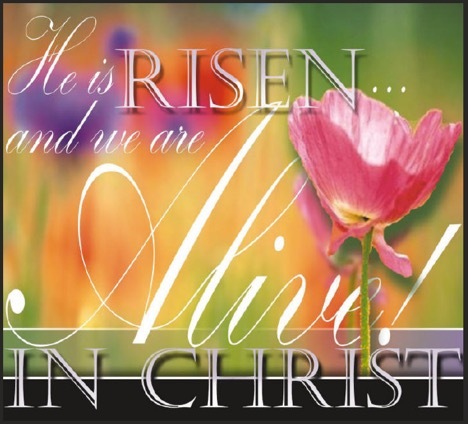 On behalf of Fathers Patrick, Tom and the Staff I wish you God blessings as we celebrate the joy of Christ’s victory over death. 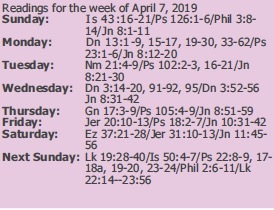 Know of my prayers for you this day and throughout the Easter season. 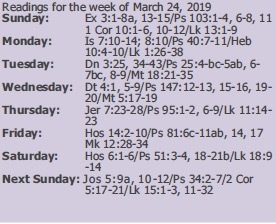 Thank you to all for your support of the parish and its activities during Lent and Holy Week. I appreciate your faithfulness to the parish! Daily Mass will not be celebrated in the rectory chapel this week from April 22-24. 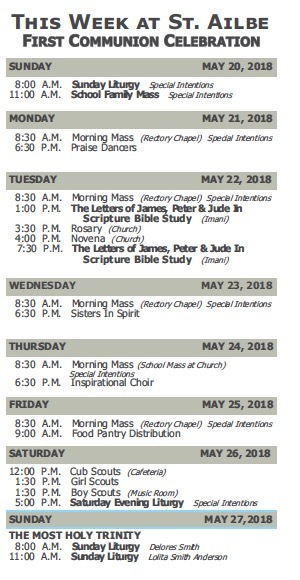 Mass will resume in the chapel on April 25th. NO funerals will likewise be held on these days. 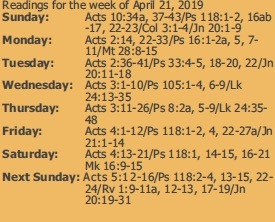 Scripture study with faith sharing will resume on May 1st. ALL are encouraged to participate. We meet at 10:00 a.m. and 6:30 p.m. in the Imani Room. Mother’s Day is right around the corner! Please invite your mothers to join us for the liturgies. 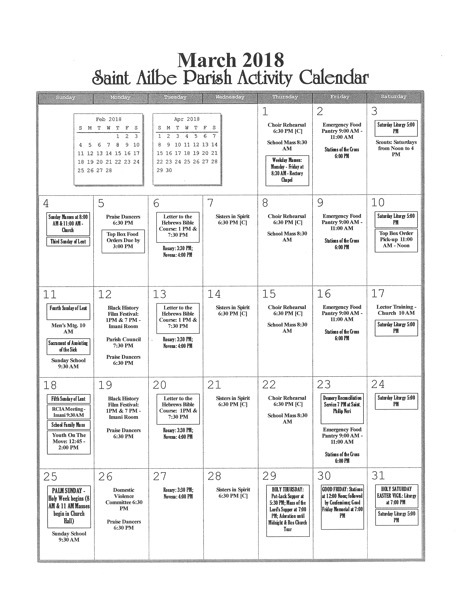 Holy Thursday, April 18th: Potluck Super in the parish hall at 5 p.m. Please join us for food and fellowship before we gather around the altar to celebrate the Last Supper with the washing of feet at 7 p.m.
Good Friday, April 19th: The Liturgy of the Lord’s Passion and Veneration of the Cross with Holy Communion at 3:00 p.m. The Living Stations of the Cross will be presented at 7 p.m.
Holy Saturday, April 20th: Easter Vigil at 7 p.m. We will welcome Christopher Ware into full communion in the Catholic Church at this liturgy. I look forward to seeing you throughout the week! May the Lord bless each of you! The Living Stations of the Cross will be presented in the Church on Friday, April 12th and Good Friday, April 19th at 7:00 p.m. The Living Stations’ cast is hard at work practicing for these presentations. Please plan to join us on these two evenings as we meditate and reflect on Jesus’ final hours of earthly life. There will be only one Mass at 10:00 a.m. on Palm Sunday, April 14th as we begin Holy Week. The blessing of palms will take place in the parish hall and we will process into the church afterwards. Please make a special effort to be on time for this liturgy as we anticipate a full church! You are encouraged to wear red this day! 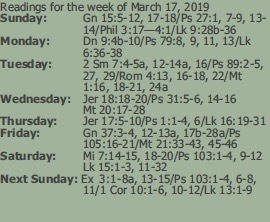 See the Flyer in the bulletin for the Holy Week schedule! On Holy Thursday, April 18th, there will be a Pot Luck Supper at 5:00 p.m. in the Parish Hall prior to the celebration of the Mass of the Lord’s Supper at 7:00 p.m. We are in need of food donations! If you are able and willing to assist us, please sign up on the sheets on the table in the vestibule. The parish will provide the meat entrée. Thanks in advance for your generosity! On Holy Thursday, April 18th, there will be a Pot Luck Supper at 5:00 p.m. in the Parish Hall prior to the celebration of the Mass of the Lord’s Supper at 7:00 p.m. We are in need of food donations! If you are able and willing to assist us, please sign up on the sheets on the table in the vestibule. The parish will provide the meat entrees. Thanks in advance for your generosity. 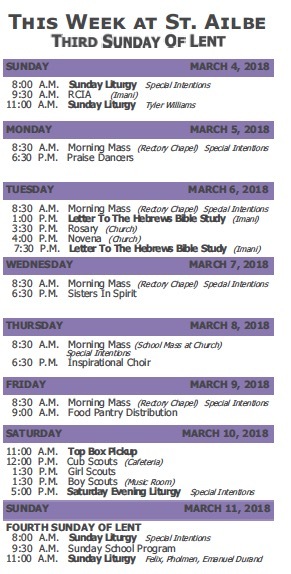 The parish’s Lenten revival is scheduled for March 24-26. This revival is an opportunity to renew our spiritual selves as we journey through Lent. The first night is dedicated to youth and young adults. Please plan to participate in the revival and spread the word to your friends and family. See the flyer in the bulletin for further information. 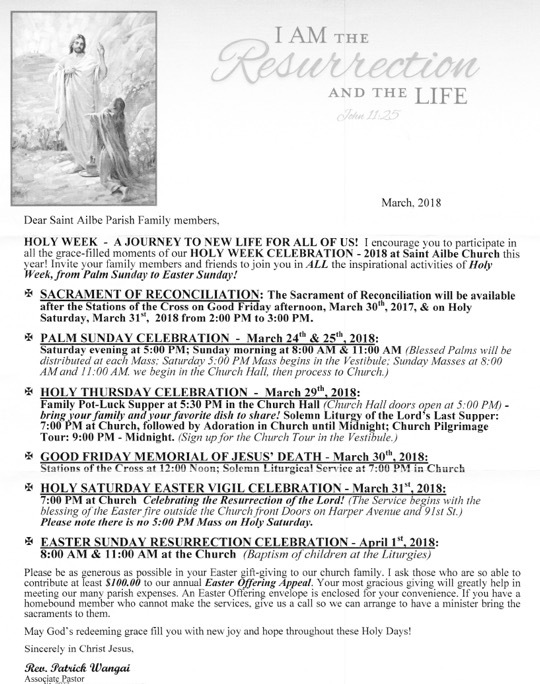 If you have not received the Sacrament of Confirmation, please complete the flyer in the bulletin! Classes will be forming soon. Checks may now be written payable to St. Katharine Drexel Parish. Thank you for your patience during this transition! Ladies, please consider participating in the Emmaus retreat weekend in October. Please see the flyer in the bulletin for further information. The parish’s Lenten revival is scheduled for March 24-25. This revival is an opportunity to renew our spiritual selves as we journey through Lent. The first night is dedicated to youth and young adults. Please plan to participate in the revival and spread the word to your friends and family. See the flyer in the bulletin for further information. Women’s Day will be celebrated on Sunday, March 17th. Please invite all women who are important to you to join us at the 8:00 or 11:00 a.m. Masses as we celebrate the wonderful women of our parish. 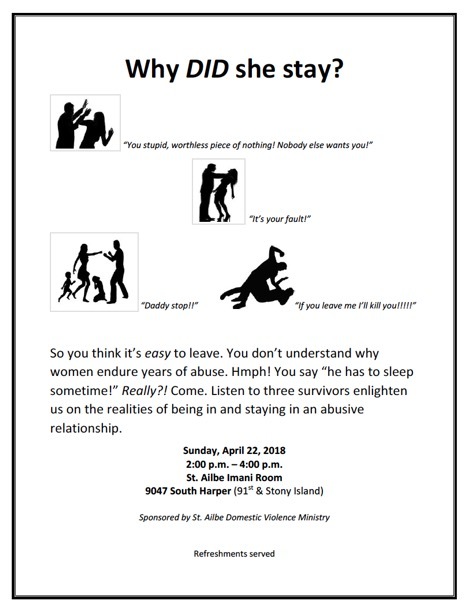 Dr. Kimberly Lymore of St. Sabina will be the guest speaker. The parish office will be closed on Monday, February 18th in observance of Presidents’ Day. The office will resume its usual business hours on Tuesday, February 19th. A Memorial Mass will be celebrated on Tuesday, February 19th as we observe the first anniversary of Fr. Duris’ death. The mass will be celebrated at 7:00 p.m. All are welcome to attend! Sunday, March 3rd is the Solemnity of St. Katharine Drexel. There will be only one Mass that day at 10:00 a.m. Sr. Jane Nesmith, will be our guest speaker. A potluck luncheon will follow in the parish hall immediately after the Mass. Please mark your calendars! 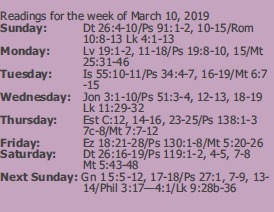 The Lenten season begins with Ash Wednesday, March 6th. 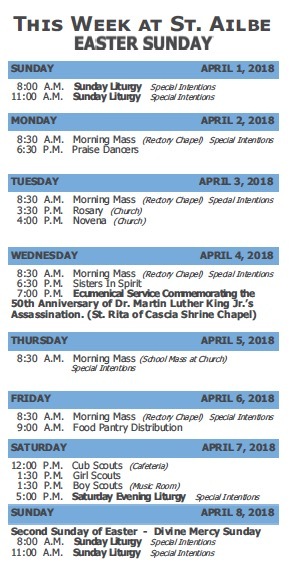 Masses with the distribution of ashes will take place at 8:30 a.m. in the church and at 7:00 p.m. Further information will be forthcoming regarding Lenten activities at our parish. Stay Tuned! Youth on the Move is back with its highly anticipated Motown Live Fundraiser on Sunday, February 17th at 2 p.m. Tickets for the event will be sold in the vestibule immediately following the Masses this weekend. Sunday, February 10th is World Marriage Day! At all Masses that weekend, married couples are invited and encouraged to renew their wedding vows and receive a special blessing. If you wish to dress formally for the event, please do so. Hospitality will be provided after each Mass! Youth on the Move is back with its highly anticipated Motown Live Fundraiser on Sunday, February 17th at 1 p.m. Tickets for the event will be sold in the vestibule immediately following the Masses this weekend. A Memorial Mass will be celebrated on Tuesday, February 19th as we observe the first anniversary of Fr. Duris’ death. The mass will be celebrated at 7:00 p.m. All are welcome to attend. Black History Month begins on Friday, February 1st! 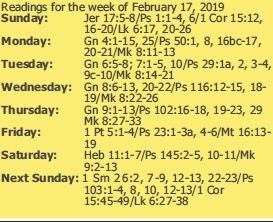 Next weekend the elders in the parish will receive a special blessing at all Masses. Make sure to bring your parents and grandparents to church with you! Afrocentric attire is appropriate to be worn at Masses throughout the month of February. Please listen to Chicago Catholic Radio, 750 am WNDZ every Tuesday from 8:008:30 a.m., when our deacon, John Cook, hosts a weekly program that highlights the Black Catholic community of Chicago. This past week, Fr. Paul was the guest speaking about our parish, St. Katharine Drexel. Listen live or see archives @ http://legacy.archchicago.org/radioTV/ Programs/BlackCatholicInitiative/. The Parish Office will be closed on Monday, January 21st in honor of the Rev. Dr. Martin Luther King, Jr. holiday. The office will reopen for regular business hours on Tuesday, January 22nd. Here we are about to begin a new year! So many things have happened in the parish and in our families, some good and some not so good, some of which we would rather forget. But God is still on the throne! Those aspects of our lives that were not so good in 2018, we leave behind and move forward into 2019. Today, as we come together as a parish family under one roof, I thank God for the blessings that He has given us. The “Renew My Church” initiative continues as we move into the final phase: evangelization. Each of us is being called to share the good news of Jesus Christ with others. If the Church is to be relevant in our day and time we need to be about taking the Gospel of Jesus Christ seriously. I will be speaking more about this in the coming months. I pray that each of you will have a blessed and prosperous New Year! Let us keep one another in prayer. May God bless you! 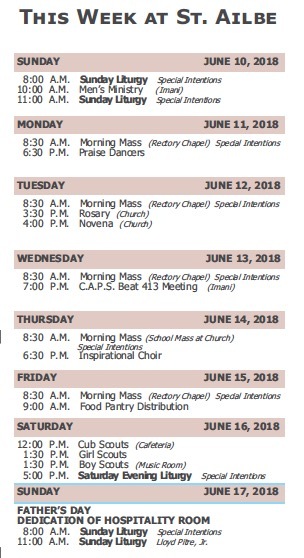 Please be mindful of the Christmas Mass schedule that is found in today’s Parish Bulletin! 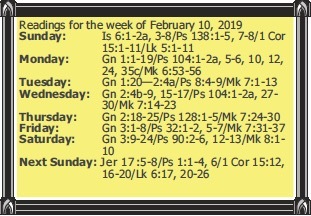 The times for Masses for the next two weeks are located on the schedule. Please invite your family and friends to join us in celebrating Christmas and the various feasts that follow. Next weekend, December 30th, we will come together permanently under one roof. After months of prayer, fellowship, and planning, St. Katharine Drexel parishioners will now worship together. I recognize the anger, disappointment, sadness and other emotions that are present among some, but I am also aware of the hope and even the joy that some people exude at the thought of what God is about to do for us as a new faith community. We, the People of God, are the Church! 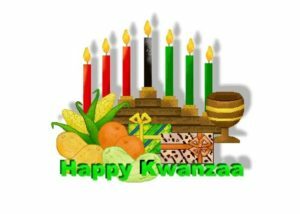 May God bless us one and all! Let the Church say, Amen! ALL families will receive a special blessing as we gather for the Unification Mass at the St. Ailbe worship-site at 10:00 a.m. on the Feast of the Holy Family, December 30th. Families are strongly encouraged to worship together on that day. On Sunday, December 23rd, we will celebrate a Unity Mass at 10:00 a.m. at the St. Ailbe worship-site. Mass will not be celebrated at the St. Felicitas worship-site. Please mark your calendars! The 5:00 p.m. Mass on Saturday, December 22nd will be celebrated as usual. On Saturday, December 15th, a Memorial Mass will be celebrated at 10:00 a.m. at the St. Felicitas worship-site to honor the memory of the Most Rev. Dominic Carmon, retired Auxiliary Bishop of New Orleans who died on November 11th. Bishop Carmon served as Pastor of St. Elizabeth and Our Lady of the Garden Parishes here in the Archdiocese for many years. All are welcome to attend! There will be a second collection next weekend, December 8-9, at all Masses to support the Religious Retirement Fund. This annual collection helps to support the many consecrated women and men who taught in our schools, worked in hospitals and parishes all for a meager wage. As fewer women and men are entering religious life and because of a lack of able-bodied professed members to support them, their finances are now in jeopardy. Your financial assistance helps to support these women and men who have given their lives to the Church. Thanks in advance for your generosity! Saturday, December 8th is the solemnity of the Immaculate Conception, the patroness of our country. It is a holy day of obligation! Mass will be celebrated at 9:00 a.m. in the church at the St. Ailbe worship-site. Please mark your calendars! Note: This Mass does not count for your attendance at Sunday Mass! Baptisms will take place at the St. Ailbe worship-site on Sunday, December 2nd and at the St. Felicitas worship-site on Sunday, December 9th. Please contact the respective parish office to register your child. Parents and/or guardians must be registered members of the parish and at least one godparent must be a practicing Catholic. If you have any questions, please contact Fr. Paul. The Parish Offices at our three worship sites will close at Noon on Wednesday, November 21st and will remain closed through November 25th. The offices will re-open for regular business hours on Monday, November 26th. Please make a note of this! Mass on Thanksgiving Day, November 22nd, will be celebrated at the St. Ailbe worship-site at 10:00 a.m. All parishioners are encouraged to join us as we thank God for blessings received during the past year. Daily Mass on Friday, November 23rd, will not be celebrated in the rectory chapel. The daily Mass will resume on Monday, November 26th. There will be a second collection the weekend of November 17th-18th for the Catholic Campaign for Human Development. This collection helps to build up the church through the growth of small businesses while the same time providing jobs and other resources for local communities. Please be generous! Mass on Thanksgiving Day, November 22nd, will be celebrated at the St. Ailbe worship site at 10:00 a.m. All parishioners are encouraged to join us as we thank God for blessings received during the past year. Remember, next Saturday, November 3rd is the Pastor’s Installation at 5:00 p.m. All are welcome to attend. Mass for All Saints Day, November 1st, will be at 8:30 a.m. in the Church. It is a Holy Day of Obligation. There will be no evening Mass for that feast, due to choir rehearsal. Mass for All Souls Day, November 2nd, will be at 8:30 a.m. in the Church. There will be an All Souls Day prayer service at 6:30 p.m. in the church. Remember and Pray for your special loved ones. On Sunday, November 4th, we will celebrate a Unity Mass at 10:00 a.m. at St. Katherine Drexel Parish – St. Ailbe site. Masses will not be celebrated at the St. Felicitas or St. Joachim worship sites that day. Our guest celebrant and preacher is Redemptorist Fr. Maurice Nutt. All parishioners are strongly encouraged to attend this unity liturgy. Please invite your family and friends to join us! Mass for All Saint Day, November 1st, will be at 8:30 a.m. in the Church. It is a HolyDay of Obligation. There will be no eveningMass for that feast, due to choir rehearsal. Mass for All Souls Day, November 2nd, will be at 8:30 a.m. in the Church. There will be an All Souls Day prayer service at6:30 p.m. in the church. Remember andPray for your special loved ones. On Sunday, November 4th, we will celebrate a Unity Mass at 10:00 a.m. at St.Katherine Drexel Parish – St. Ailbe site.Masses will not be celebrated at the St. Felicitas or St. Joachim worship sites that day. Our guest celebrant and preacher is Redemptorist Fr. Maurice Nutt. All parishioners are strongly encouraged to attend this unity liturgy. Please invite your family and friends to join us! The October counts will go through the entire month of October. Please make sure that you are present in Church so that you can be counted. The parish office will be closed at each worship site on Monday, Oct. 8th in observance of the Columbus Day holiday. Regular office hours will resume on Tuesday, Oct. 9th. Mass will be celebrated in the rectory chapel on Oct. 8th. We will celebrate Family and Friends’ Day at all Masses on the weekend of Oct. 20th and 21st. Please invite your family and friends to join you for worship! · October is fast approaching so be mindful that the October counts begin the weekend of October 6th and 7th. Please make sure that you are present in Church, so that you can be counted. · Fathers Paul and Patrick will be attending the Renew My Church Summit in Rosemont from Monday through Wednesday, Oct. 1–3. Instead of daily Mass, Sr. Judy and Sr. Kate will conduct a Communion Service in the rectory chapel. Daily Mass will resume on Thursday, Oct. 4th. · The parish office will be closed at each worship site on Monday, Oct. 8th in observance of the Columbus Day holiday. Regular office hours will resume on Tuesday, Oct. 9th. Mass will be celebrated in the rectory chapel on Oct. 8th. · We will celebrate Family and Friends’ Day at all Masses on the weekend of Oct. 20th and 21st. Please invite your family and friends to join you for worship. The Angelic Choir will rehearse Sunday, September 23rd. October is fast approaching so be mindful that the October counts begin the weekend of October 6th and 7th. Please make sure that you are present in Church, so that you can be counted. The Angelic Choir will rehearse Sundays, September 9th, 16th and 23rd. If you are submitting an insert for the Sunday bulletin, please only submit a black and white original, which produces a much sharper image. Failure to honor this request will delay our ability to include your flyer in the bulletin. As of August 19, 2018, we have 169 registered walkers, who prayerfully will show up and step across the entrance line. Donations are a delight! At present, we are $14,000 short of the $15,000 monetary goal. October 8, 2018 is deadline for Hunger Walk donations to benefit St. Ailbe A01307. Wednesday, August 15th is the solemnity of the Assumption of the Blessed Virgin Mary. It is a holy day of obligation. Masses will only be celebrated at St. Ailbe Church at 8:30 a.m. and 6:30 p.m. Please spread the word! The Black Catholic Deacons of Chicago are hosting a Sunrise Mass to pray for non-violence in our hearts, families, schools and streets on Saturday, August 25th at Oakwood Beach, 41st St. and Lakeshore Drive, beginning at 6:30 a.m. In the event of heavy rain, the Mass will be moved to Holy Angels Church at 615 East Oakwood Blvd., Chicago, IL. All are invited to participate! 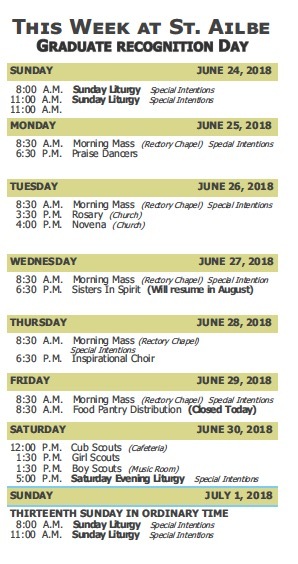 Daily Mass will not be celebrated in the St. Ailbe rectory chapel from July 30 through August 2. The priests and two of the deacon couples will be in New Orleans, La., attending the Joint Conference of the National Black Catholic Clergy Caucus, the National Black Catholic Sisters Conference, the National Association of African American Catholic Deacons, and the National Black Catholic Seminarians Association. Daily Mass will resume on Friday, August 3 at its usual time. 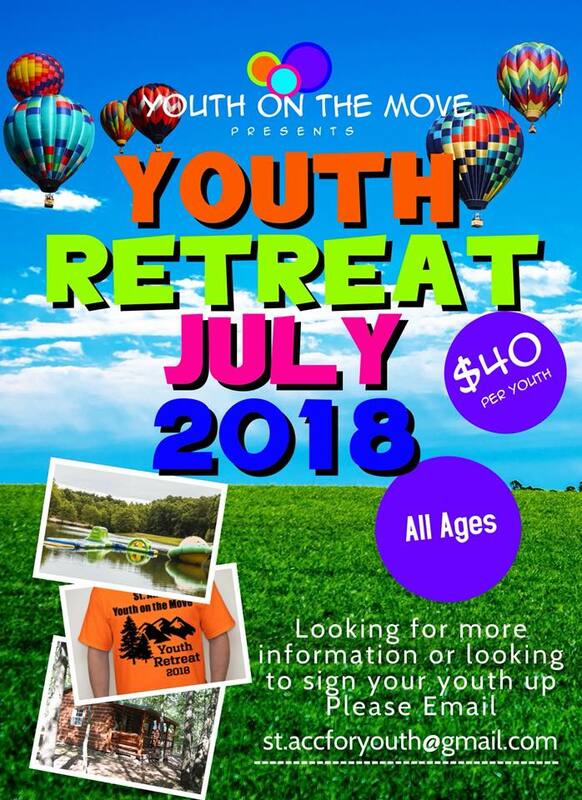 If you have a youth who is interested in a retreat experience of a lifetime, please contact ministry leader, Kianda Boyd at st.accforyouth@gmail.com. 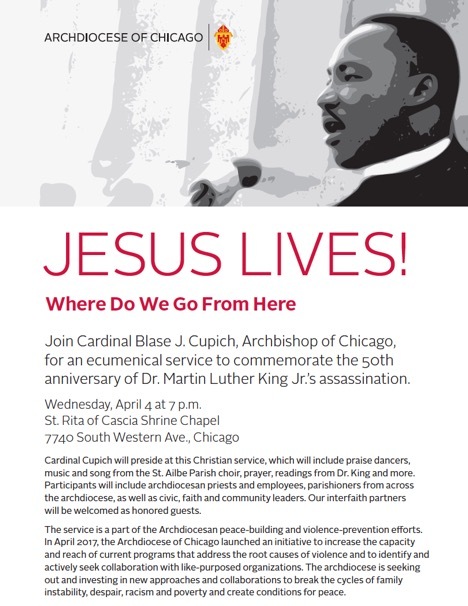 Join Cardinal Blase J. Cupich, Archbishop of Chicago, and the st. ailbe choir for an ecumenical service to commemorate the 50th anniversary of Dr. Martin Luther King Jr.’s assassination. Masses at 8:30 a.m. and 6:30 p.m.